In recent weeks, there’s been growing interest in whether the Bank of England is thinking about raising rates sooner than expected. Unemployment slack measures the the number of people actively looking for work, but are unable to find it. So, for example, this would not include retired people, because they don’t have a job, but aren’t looking fo work. 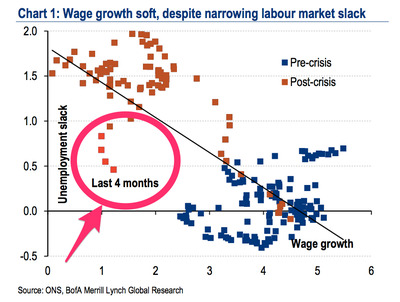 In the chart above, despite a relatively steep drop in unemployment slack, wage growth has failed to improve. The chart nicely illustrates the dilemma facing the MPC: At current levels of unemployment, one would expect the orange dots (post-crisis) to start converging with the blue dots (pre-crisis) as wage growth increases. But that’s not what happened. So how can we explain Weale’s concern? Weale was looking at the difference between survey data, which has shown employers reporting between 2-4% growth in wage settlements, and the official Average Weekly Earnings figures which show wages growing at a much more modest pace of around 1%. This spread between the two could in part be a consequence of the surveys over-prioritising certain sectors that have seen higher-than-average wage increases. In particular they may have been too heavily weighted toward higher skilled full-time staff versus casualised lower skilled workers that have taken an increasingly large share of the total UK labour market since the onset of the crisis. Given the split in trajectory between the groups monetary policymakers are having to look through headline figures of unemployment slack to gauge whether lower unemployment will lead to higher inflation. At present, that picture is one of very limited wage pressures well below what the Bank has expected as increases in the supply of labour has more than offset any rise in demand. Given that raising rates before wage rises start gaining momentum risks putting households into financial difficulty and possibly threatening the overall economic recovery, the majority of the MPC clearly believe caution is still warranted. Of course, if wage growth starts to surprise on the upside they may have to change their opinion.